Every good besieged castle needs something horrible they can throw over the ramparts onto attacking foes. Although why I'm making it when I'm going to be playing the attacking force is beyond me. Masochism I guess. Anyway, as we'll be using the Warhammer 6th Edition rules, that calls for us to have at out disposal some rocks and cauldrons (which can contain several different unpleasant concoctions). 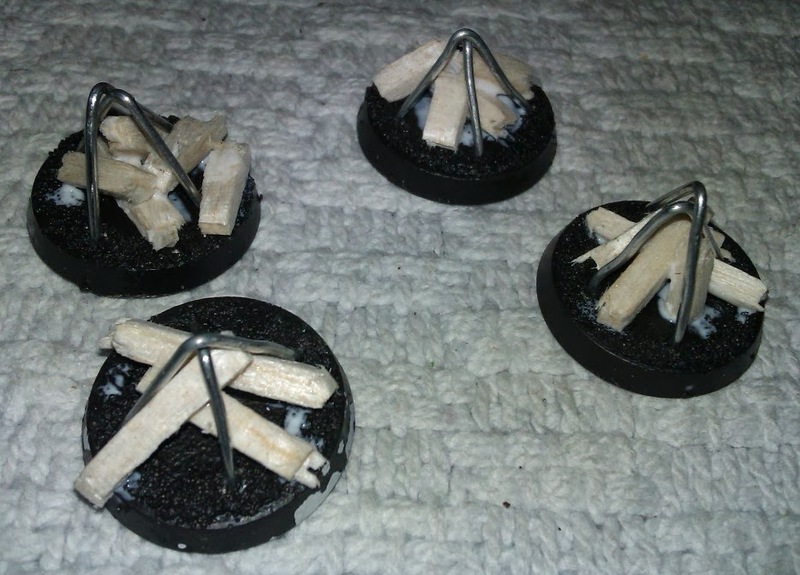 I've decided to build these on 1'' round (W40K) bases and only to build a small number of them too - just enough that each unit so equipped can be allocated one as a marker to say they have purchased them. I guess in reality there would be many of them scattered all over the battlements, but that's more work than I'm happy to do right now. Keep it simple - I've got enough on my plate. This is a two-part post. In this, the first part, I take the "Piles of rocks" from start to finish and in the second I'll deal with making the "Cauldrons". I've always thought the easiest way to represent rocks is to use rocks. These come from a bag of aquarium gravel which has a great "rocky" look to it. 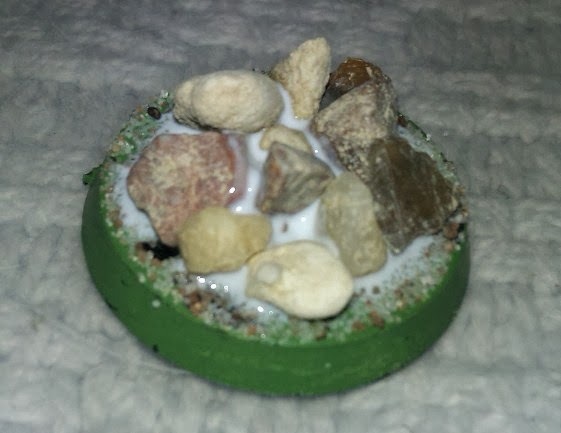 The first thing I did was to PVA on a ring of sand for a bit of base texture. When dry, add a generous amount of PVA to the middle of the base. 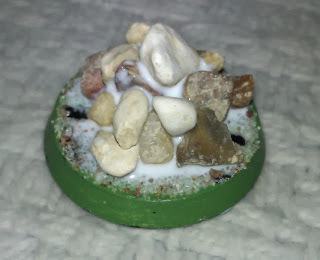 When dry, add another layer of PVA and gravel. Do this as many times as you need to to get the size and shape of rock pile you want. I was actually lazy about this and did it all in one go without waiting for the PVA to dry, which is why you can still see the white glue on the bottom layer of stones in the final picture. You can do it that way, but you will find your stones slipping and sliding around as you add more to the bases. Better to wait for it to dry. You definitely need it to be dry for the next bit. 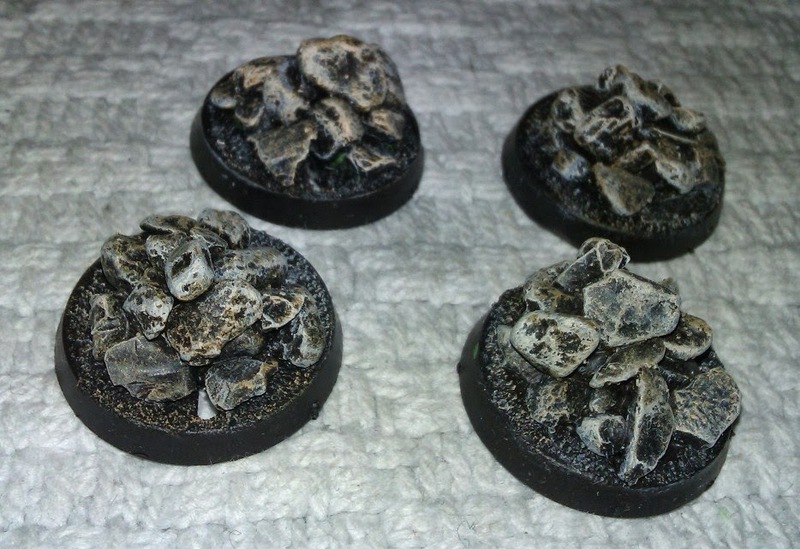 Paint the whole thing black, then drybrush the stones (only - avoid the sand) with some Citadel "Bronzed Flesh". You could use any sandy, tan or grey shade you want here. 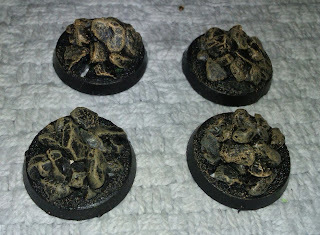 My castle model is going to be grey and I wanted these to stand out from it so I went with a flesh-tone. Then add a final drybrushed highlight of white (and I did hit the sand this time). Job done. You can obviously make great use of this technique for scenery pieces too. Glued to 4'' x 1'' strips of plasticard this technique makes brilliant dry-stone-walls, for example. 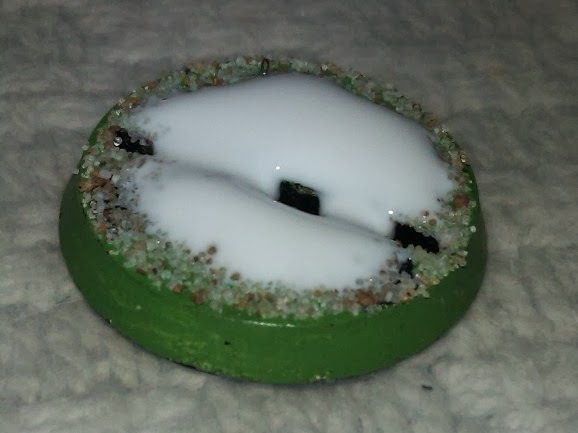 I started by taking 1'' round bases and drilling four small holes at "opposite corners" (if a round base can be said to have such a thing). 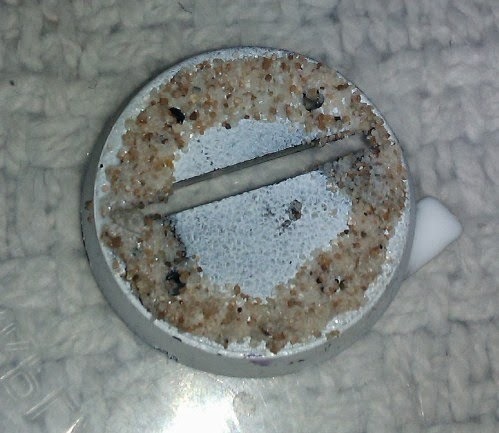 I then PVA glued a ring of sand to the top in the same way as had been done for the rock piles. 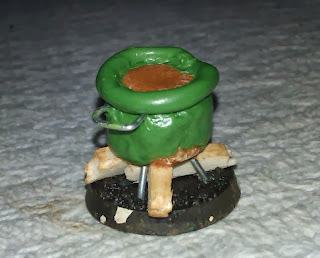 The holes were there so that I could anchor the cauldron's feet to the bases. 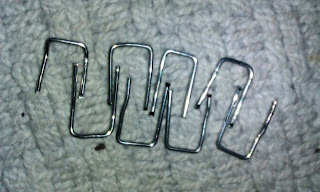 To make the feet I cut some large paperclips to length and bent them into "V" shapes. Two for each cauldron. I then pushed these through the holes in the base. One is shown on its side so you can see the wire bent over to fix it down. I'm not sure why but I painted the sand black before I did this bit. 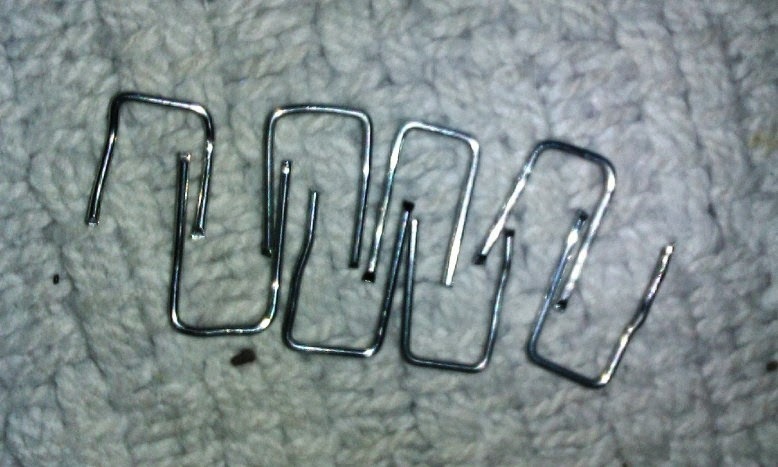 A blob of glue from my hot-glue gun fixes these permanently in place. I then PVAd some broken lengths of balsa wood to the top of the base to represent the woodpile that is (hopefully - depends on my meagre sculpting ability) going to be burning to heat the cauldrons. This is the point where I stopped being happy with my progress. The plan from here was to add a lump of Milliput to form the contents of the cauldrons. 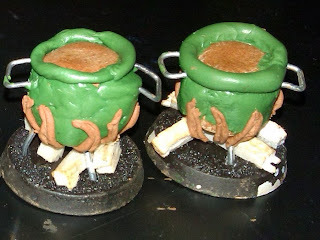 It would also serve as an armature for the cauldron itself which will be sculpted around the armature. 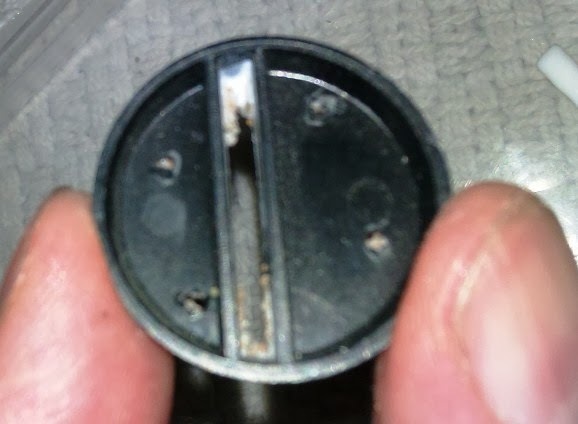 However, what I found was that my Milliput was cracking and breaking as I worked it and I couldn't get it to satisfactorily form around the interlocking wire "V"s. As such I kept mis-shaping it and pushing it off-centre and so on. I did the best I could with it and then left it to look at it with fresh eyes after a day or two. 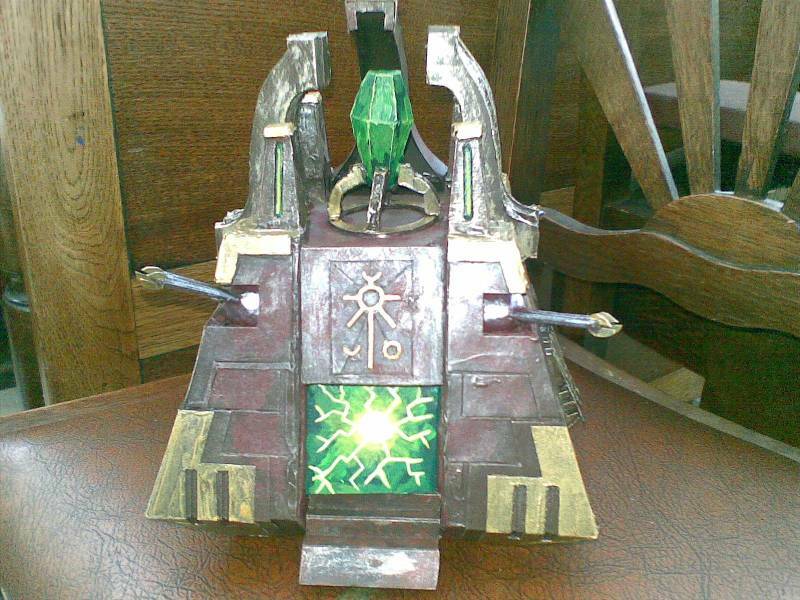 At this stage I also inserted into the Milliput some more bits of paper-clip (taken from small paper-clips this time) bent to represent the handles of the cauldrons. These look pretty rough from the photos, but we'll see what happens. I'm concerned that my Milliput may have "gone off" from the way it was behaving when I was working it. If so they may not even set hard. I did find the green stuff quite tricky to work with though - it was far stiffer and stickier than I was expecting, making it quite difficult to shape especially as it was constantly sticking to my fingers and tools. 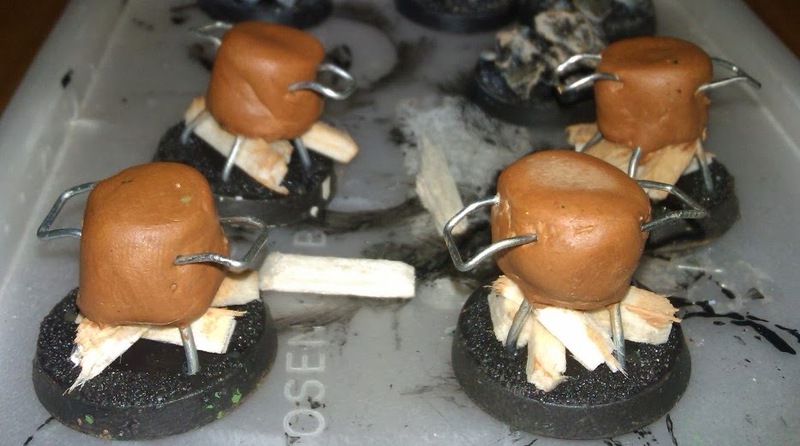 They're a bit "rough-and-ready" and the rims are decidedly wobbly, but at the end of the day it's only been 2.5 hours work to make some simple markers to show which units in the castle have access to vats of boiling unpleasantness to tip on their foe, so I think they'll do the job nicely. I'm certainly happy enough with them. A few years ago my friend Mike (a.k.a. "The Old Giant") was collecting a Warhammer 40,000 Necron Army. He's since become disillusioned with it (I think he was finding it too easy to beat my Imperial Guard) and sold most of it off. 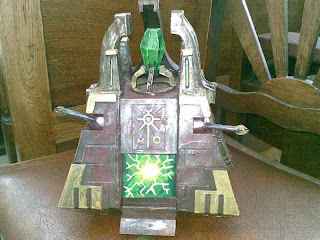 As part of the same phase of craziness that had me scratch-building a Warhound Titan and Ork Stompa, I also set about building a Necron Monolith for Mike. It was built from cardstock plans (available here) and constructed from a combination of plasticard and cardboard. It went a little "out of true" in places, but served its purpose fairly well, I think. 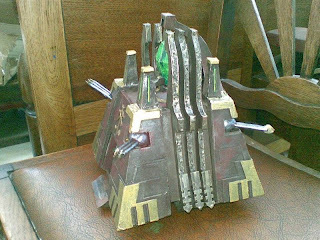 This is an Ork Stompa that I scratch-built in a hurry for a game of Apocalypse that was played at Warhammer World early in 2009. 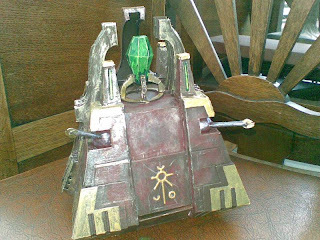 It formed part of a hastily thrown-together Ork Army which teamed up with Mike's Necrons in order to lose to Jamie and his friend Sean's combined Marine forces. It was an immense game (6500pts per side) and featured the Warhound Titan and a scratchbuilt Ork BattleWagon and Necron Monolith amongst others. The model is shown here with just a quick brown-spray undercoat and a bit of drybrushing- I'll get it painted eventually. For its basis, the model is built from 2 octagons of foamboard, one twice the size of the other. One forms the base of the body, and the other the top (sitting just below the shoulders). The two are held in place by a 1/2'' plastic tube which runs from top to bottom, through which is "skewered" a 1/4'' tube in a cruciform - the 1/2'' tube forms the "spine" and the 1/4'' tube the arm-mounts. The two octagons, if looked at from above are positioned such that the smaller one is placed with it's back edge directly above the back edge of the base. This makes for a good slope down the front of the model. 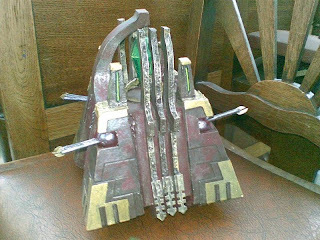 I made side-plates by simply resting the model on its front/sides/back in turn on a piece of card and marking with a pen where the corners of each octagon side rested. I cut these out, glued and pinned them in place and this gave me a fully enclosed and interestingly shaped "box". The shoulder platform is just a rough-cut unevenly shaped piece of foamboard. The Close-Combat weapon is a plasticard construction based loosely on a leg from the Warhound Titan model. The weapons shoulder is a roughly shaped card box (not quite rectangular when seen from above - there's a "dip" in the middle) which has been drenched in every weapon and missile-looking goody I could find (the big fat looking missile on the underside and the missile protruding from the Stompa's belly are actually the scavenged remains of some fireworks I found in the park, the rest came from the bits box or were scratch-built (the Gatling gun). The head is built from card and plasticard, the spotter's nest came from inside a Kinder chocolate egg (I just cut a card rectangle for the window and another for the door at the back). The Spotter's nest struts and weapons arm support were made from some carbon fibre rods I bought from my local hobby shop. The exhaust pipes behind the head are simply some 1/4'' pipe cut roughly and glued in place. The entire thing is then festooned with cardboard and plasticard plates, overlapping each other at random. The corrugated iron plates were courtesy of a roll of corrugated card bought from a craft shop - you get a roll about 1m x 50cm for about £2.00 and just cut to shape. The metal mesh comes from a car repair shop - it's use for glueing behind holes in car bodywork and you can then layer filler up on top to fill the hole. Again - quite inexpensive. The majority of this model is simply cardboard - I doubt if the whole thing cost more than £8.00 to build. 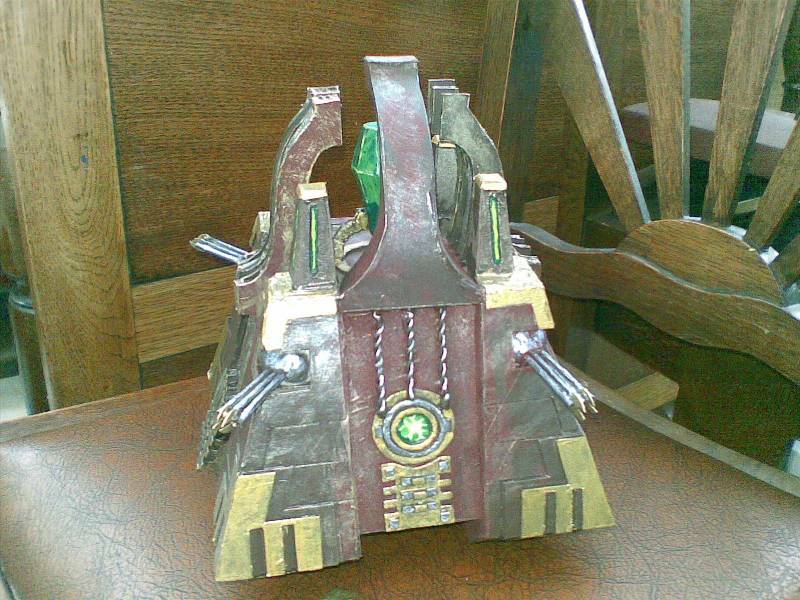 The paint-job is unfinished - just sprayed brown/black and drybrushed with a few different metal colours so far. A couple of years ago I painted up a Warriors of Chaos army that I'd collected many years previously. I added a few models to it (some plastic Marauders and Chaos Spawn) but for the most part it was built from old models from circa 1990. I fielded the army successfully against my friend Mike's Lizardmen, but one thing that struck us both was how underpowered the Daemon Prince character was. Flying was a great advantage, but his ability to deal out and deal with punishment wasn't great. So I decided I needed a new General. This ultimately led me to my most ambitious conversion project to date: a Chaos Lord on Daemonic Steed. 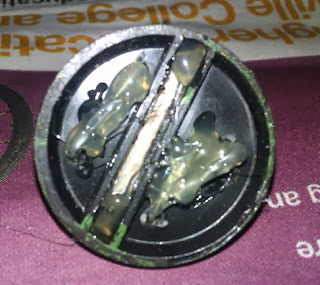 I started by taking a pair of old 25mm x 50mm cavalry bases and glueing them side-by-side to a piece of plasticard to make a 50mm x 50mm base. The slots in the bases were still going to be used to secure the model, but that entailed taking the plastic "Rough Rider" style horse I was going to use and widening it out (not a bad thing as it would have been a bit weedy otherwise). I also decided I wanted to give some "animus" to the model by having the horse rearing. I severed the plastic ties between the horse's front hooves and the strips that would fit into the base, then carefully cut around the join between the horse's hindquarters and "stomach". I filled the model with modelling clay and also inserted a piece of thick wire to hold it in position whilst the clay set. Once set, I filled in a few gaps with a bit more modelling clay, and then decided that what would make this horse particularly Daemonic would be to be two headed! I found a couple of armoured horse heads in my bits box and drilled, pinned & glued them together. 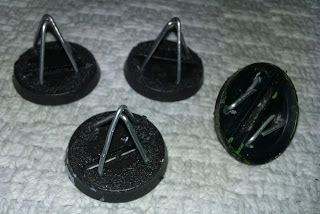 These were then mounted onto the torso with another pin & glue job. Last but not least, the General himself. 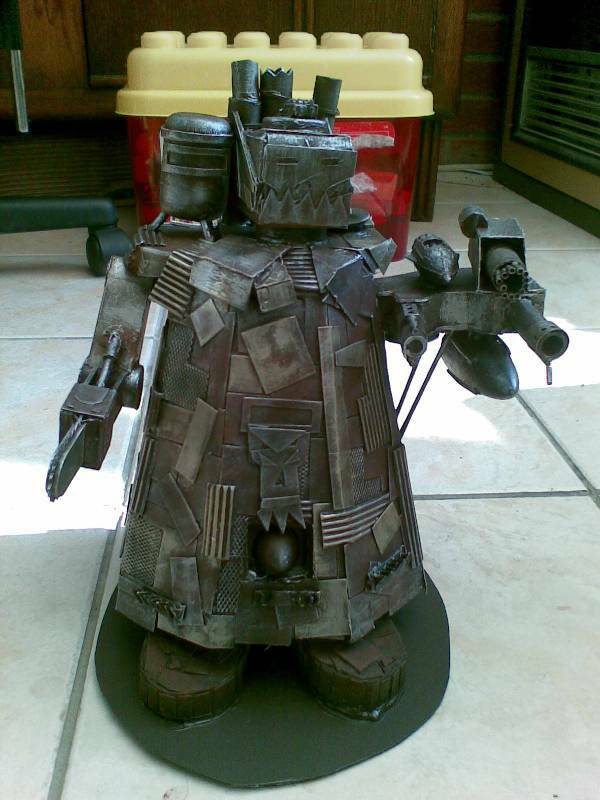 This guy was made from bits from my bits-box. His legs were removed from the torso, split up the middle of his groin, pinned back together at a distance that would allow them to straddle the widened horse and then the gap filled with modelling clay. His left arm was replaced with a big claw-thingy from I-don't-know-where and I added a fur cape with modelling clay. That was about it. Job done. I've just found this brilliant video on the "miniwargaming.com" website. If you've never seen it, please spend the next 7 minutes of your life checking it out. I guarantee you will laugh at least once.